D.C.'s long delayed streetcar system has drawn much skepticism, but lessons can be learned from Atlanta, which rolled out its streetcars about a year ago. "The first year was full of a lot of missteps for the Atlanta streetcar," Atlanta Journal Constitution transportation reporter Andria Simmons said. There were management problems, lax safety checks, inadequate police force for security, and issues with the homeless who decided the free Atlanta streetcar was a great place to take shelter. "Some of these things you probably had to learn through experience," Simmons said. "The mayor has likened it to scraping your knee." With DC's new streetcar system up and running, News4 is taking notes on what Atlanta's streetcar system has dealt with in its first year. Riders may not be the most important part of funding this project. Adam Tuss reports from Atlanta. D.C. hopes a bandage isn't needed. While D.C.'s system is free to ride for now, Atlanta recently started charging $1 to ride, and at least anecdotally, ridership has dropped. Atlanta streetcar officials say about 880,000 people rode their system in 2015, when it was free. That number is expected to drop precipitously when new ridership calculations are tallied. Atlanta isn't looking for fares to pay for its system. The city is more interested in the tax revenue generated from development that's spurred along the streetcar corridor. "Ridership is really important, but we don't have a specific number that we have to achieve or are trying to achieve," said AJ Robinson, president of Central Atlanta Progress, which is intricately involved in the streetcar project. "And that's very hard for people to understand, because people think you should have built a road with that (tax revenue). But a road doesn't necessarily cause economic development." Development is a big part of the game in D.C. as well, and a city official who spoke on the condition of anonymity agreed that a case could be made for development being more important than ridership. After a decade of delays, D.C.'s streetcar system is finally up and running. 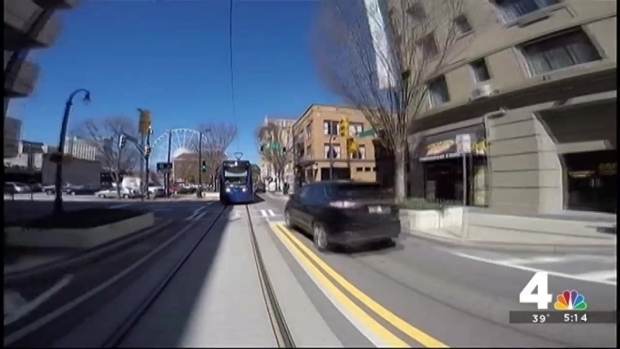 News4's Adam Tuss traveled to Atlanta to see how their streetcar system is running, and find out what D.C. can do to ensure its success. Robinson said Atlanta's streetcar is about knitting neighborhoods together and giving a heavily car dependent community a new choice. Atlanta's 2.7-mile streetcar system cost about $100 million to build. DC's 2.4-mile system cost about $200 million. "I see people's point of view that it's not worth the expense," Robinson said. "But I would say the same about a road that you go on once in your life. Was it really worth the $100 million to build? People don't think that way." Robinson said at least in Atlanta, they are trying to convey a message that the heart of the city is important for everyone, whether you live in the city or the suburbs. As far as the operations of Atlanta's system, the fare payment system is something for D.C. to study closely. Ticketing itself can get clumsy. Riders buy tickets on the platform and then show the ticket as they board. If a rider doesn't have a ticket, an official on board who checks tickets may stop the streetcar and make you pay. One rider relayed an experience where the machine wouldn't take a credit card. The entire process can slow the system down. Simmons said the biggest problem Atlanta has faced with its system has been management. "There's a real shortage of people who are experienced with streetcars, because there are so many of them opening all over the country, and there are only a few of them that know how to do this specialized area of transit," she said. D.C. leaders said they're confident they have solved the issue of proper management. The question still being asked is does this all make sense? For right now, at least for D.C. and Atlanta, the answer probably only will be revealed by time. "It's still very much up in the air whether or not this could be called a success or not," said Simmons.